Filed under: A/C.3/63/L.22/Rev.1, Ban Ki-moon, Defamation of Religions, FITNA, Hadith, Qur'an, resolution, Tafsir, U.N., vote |	Comments Off on Quit Aiding Our Enemies! We have twelve fantastic nominations so far for The Blogger’s Halo Award. A number of the nominees have been nominated by several bloggers. And a few bloggers have made several nominations. So, if you see the nominated blog listed here, please don’t nominate that blog again. You still have to the end of the day to get other nominations in. Voting will begin tomorrow. 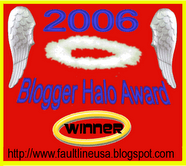 The “Blogger’s Halo Award” WILL go to the blogger who has not only created a vital up-to-the minute blog with a sizable readership and dedication to excellence, but this blogger would have gone way beyond the call of duty by demonstrating a selfless commitment to help other bloggers solve their blogging problems. 1. Link to this post in your blog. 2. Leave a comment here that describes (in about one paragraph) why you think your favorite blog should receive a Halo. (This is the honor system, so don’t nominate your own blog). 3. Leave any new nominations in the comments on this current page. Be sure to post links to your nominee’s blog as well as to your blog in the comments. 4. Links to the grateful bloggers that made nominations will also be posted when the winner(s) are announced. 5. Check back tomorrow to vote. Each blogger gets to vote for one blogger (you can’t vote for your own blog). Trackposted to Outside the Beltway, Perri Nelson’s Website, Don Surber, Stuck On Stupid, Conservative Cat, Pursuing Holiness, 123 Beta, Rightwing Guy, Wake Up America, Outside the Beltway, Faultline USA, Woman Honor Thyself, stikNstein… has no mercy, The Crazy Rants of Samantha Burns, The World According to Carl, Blue Star Chronicles, Pirate’s Cove, Renaissance Blogger, Dumb Ox News, High Desert Wanderer, and Right Voices, thanks to Linkfest Haven Deluxe. Trackposted to Blue Star Chronicles, Pirate’s Cove, Perri Nelson’s Website, Conservative Cat, Don Surber, and High Desert Wanderer, thanks to Linkfest Haven Deluxe.